An electric car crashed into a security guard at the gate of a residential community as the driver mistook the accelerator for the brake. 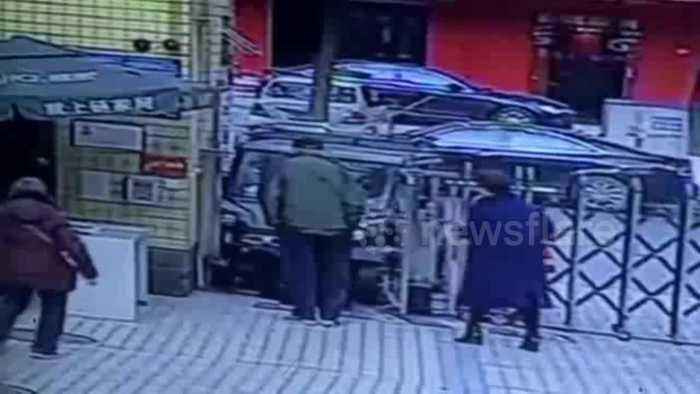 The CCTV video, filmed in Chengdu City in southern China’s Sichuan Province on January 11, shows a car slowly moving to the front of a gate suddenly speeding up to knock down a security guard standing at the corner. Nearby residents called for police and an ambulance, and the security guard was sent to hospital. Fortunately, he only suffered minor scratches to his face and legs. According to reports, neither the vehicle nor the driver have licences. 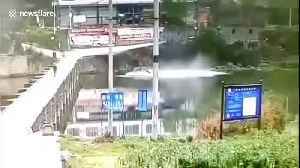 Three kind-hearted passersby rescued a driver after the car fell into a river in southwestern China. 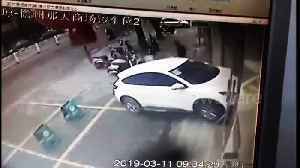 The video, filmed in Zunyi City in Guizhou Province on March 23, shows a car suddenly speeding..
A security guard&apos;s quick reaction saved him from being crushed by an SUV after a driver mistook the accelerator for the brake in southern China.